Search.yourspeedtester.com is the PUP that uses misleading techniques to prevent removal. Use Reimage to locate malicious components and get rid of them faster than with uninstall instructions. A full system scan blocks virus reappearance and prevents traffic to malicious domains. Search.yourspeedtester.com (by Polarity Technologies, Ltd.) is a highly untrustworthy search page that can replace your current homepage address without any hassle. This potentially unwanted program (PUP) goes to browser hijacker category, which means that its main distribution method is software bundling. It helps to spread the hijacker more efficiently and set hxxp://Search.yourspeedtester.com/ as default home, new tab and search provider address on more computers. Search.yourspeedtester.com is promoted on yourspeedtester[. ]com a site that suggests testing “your Internet speed from your new tab.” Although such feature sounds promising, we assure you that it is not worth swapping your current homepage, new tab and search engine address with a suspicious URL. The search engine available on the Your Speed Tester website functions like a typical ad-supported tool that aims to generate pay-per-click revenue for its developers. As a consequence, users receive modified search results instead of organic ones, and of course, lots of these are sponsored by various third-parties. Clicking these search results could be dangerous because the developer of the search tool hardly endorses content shared on advertised websites. It simply aims to generate revenue, but not to provide quality service for the users. Search.yourspeedtester.com redirect virus might unexpectedly take you to untrustworthy websites that suggest free programs, software updates, rogue system optimizers, free browser add-ons and similar software. Please, stay away from them. If you decide to install one of them on your PC, you may unwillingly add a spyware or malware type application to your system. VirusActivity experts say that malware programs are on a rise nowadays, so it is a must to keep up with the latest news about their distribution methods and functionalities. Search.yourspeedtester.com virus alters homepage settings to present a questionable search engine. It tracks victim's browsing activities and fills results' pages with ads. Search engines that deliver more ads than organic search results should not be trusted. For this reason, we suggest you to remove Search.yourspeedtester.com ASAP. You can easily change your browser’s settings afterward – set a new tab page, homepage and default search provider according to your needs. To eliminate the browser hijacker, you may want to use Search.yourspeedtester.com removal instructions provided below. It is also advisable to run a full system scan with Reimage afterward. Programs that hijack web browsers are known as browser hijackers, and they fall into PUP category. Almost all programs of this kind reach victims’ computers in a very simple way – users install them without realizing it. It usually happens when the victim doesn’t pay enough attention to statements provided in software setup. Therefore, if you tend to install programs by clicking “Next” button several times and then “Install” and “Finish” – you need to use tips we provide below. Never install free programs from unknown web sources. Even if they seem to be useful, they may contain some dangerous components that can severely damage your computer system. Be careful when installing new programs. Developers of potentially unwanted programs know that people tend to rush when adding new software to their PCs; it gives them an opportunity to take advantage of it and force unsuspecting victims to install spyware-type apps. You can remove Search.yourspeedtester.com virus using the instructions provided below the article. However, you will notice that it is quite easy to remove it – it is yet another reason why this potentially unwanted program falls to spyware and not malware category. Therefore, technically it cannot be called a virus. However, it causes numerous problems, and so it shouldn’t be kept on the computer system. To eliminate the hijacker, we recommend using Search.yourspeedtester.com removal instructions provided below. To complete the removal, you need to perform a full system scan using a spyware/malware removal tool. If you already have one, update it and run a system check. If you do not own such program, consider using one of the ones we recommend. To initiate Search.yourspeedtester.com virus removal, you must check what suspicious programs were installed on your computer recently. Find them and get rid of them ASAP. Here, look for Search.yourspeedtester.com or any other recently installed suspicious programs. Wait until you see Applications folder and look for Search.yourspeedtester.com or any other suspicious programs on it. Now right click on every of such entries and select Move to Trash. When in the new window, check Delete personal settings and select Reset again to complete Search.yourspeedtester.com removal. Once these steps are finished, Search.yourspeedtester.com should be removed from your Microsoft Edge browser. Check Firefox for Your Speed Tester extension and delete it. Here, select Search.yourspeedtester.com and other questionable plugins. Click Remove to delete these entries. Now you will see Reset Firefox to its default state message with Reset Firefox button. Click this button for several times and complete Search.yourspeedtester.com removal. 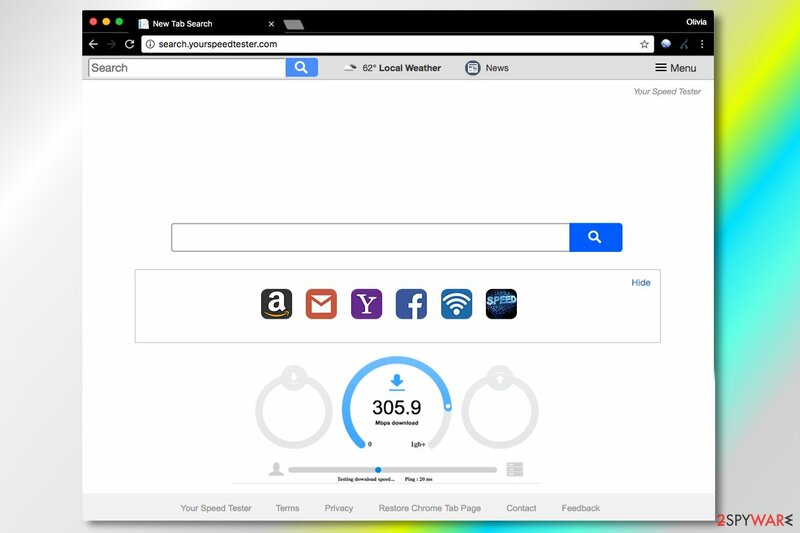 To remove the hijacker, find and delete Your Speed Tester extension from Chrome. Here, select Search.yourspeedtester.com and other malicious plugins and select trash icon to delete these entries. Click Reset to confirm this action and complete Search.yourspeedtester.com removal. Here, select Extensions and look for Search.yourspeedtester.com or other suspicious entries. Click on the Uninstall button to get rid each of them. Here, look at the Homepage field. If it was altered by Search.yourspeedtester.com, remove unwanted link and enter the one that you want to use for your searches. Remember to include the "http://" before typing in the address of the page. Now you will see a detailed dialog window filled with reset options. All of those options are usually checked, but you can specify which of them you want to reset. Click the Reset button to complete Search.yourspeedtester.com removal process. This entry was posted on 2017-07-25 at 02:45 and is filed under Stealing programs, Viruses. You can quickly scan the QR code with your mobile device and have Search.yourspeedtester.com virus manual removal instructions right in your pocket. How did you remove Search.yourspeedtester.com virus?